« Fine Gael: a family at peace? I am not very good at sitting still so when I came down with a bad cold before Christmas I was very grateful to discover a ball of wool and some needles in my house. I had something I could do to escape bad daytime tv. Since then I have made a scarf for almost everyone I know and I am trying to graduate to something more difficult- socks. Trust me- they are difficult! In an attempt to fix some of the hourly problems my pattern has presented I turned to my knitting books and went online. While the problems with my socks still remain, I discovered some interesting things about the history of knitting that I thought I would share with Pue’s readers. The earliest known knitted socks were discovered in the middle east, archeologists date them to about the thirteenth. While there are undoubtedly male knitters, there has always been a strong association of women and knitting. In the fourteenth century several Italian painters painted the Virgin Mary knitting with four or five needles, possibly knitting socks! By the late sixteenth century it was an established craft throughout Europe . An extensive cottage industry grew around the practice of knitting and it became an important source of income. But knitting was not just confined to the domestic sphere and it was one way women could become involved in international events. The rather suggestive poster above was designed c. 1917 or 1918 by L.N. 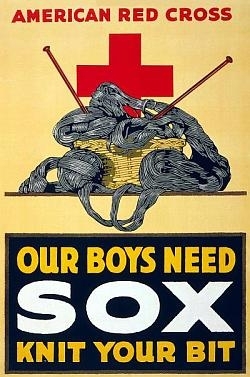 Britton for the American Red Cross to promote knitting socks for the army. Britton designed a number of posters for the war effort including the 1917 ‘Consider the possible consequences if you are careless at your work’ and war time rations posters. A huge problem was with the variety of sizes and types of socks and other clothes contributed to the cause. Governments throughout Europe and America encouraging women to ‘knit their bit’ issued patterns to standardise their donations. Those curious to see what these patterns were like can access the ‘U.S. Navy – Iceland Sweater‘, ‘Man’s Coat Sweater‘, Socks and even Gloves at the American Red Cross museum online. Eleanor Roosevelt la unched the American knitting effort for WWII when with a ‘Knit for Defense’ tea she held at the Waldorf-Astoria in New York City. Indeed she is often called ‘the first lady of kitting’. She carried her needles with her at all times to encourage women to knit. 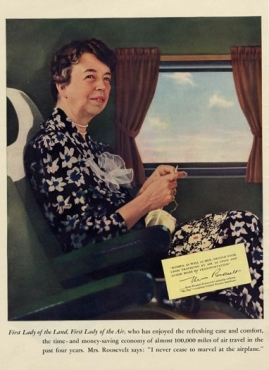 Knitting became so much a part of her image that when she was painted by John Roosevelt for a poster to encourage air travel she was portrayed knitting. 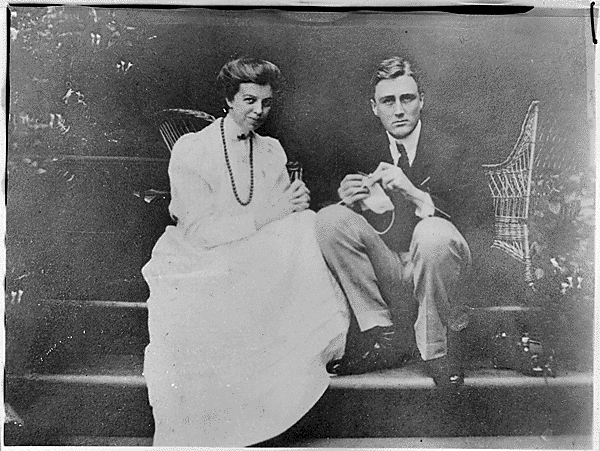 Again, this was not just a women’s past time and below is a picture of a much younger Eleanor Roosevelt sitting with her husband. In this image he is the one with the needles. Knitting seems to be making something of a comeback so for those of you already knitting or just interested in the impact of knitting there is lots of contemporary pieces on the subject. Here are just a few: For online information on the history of knitting go to the Red Cross history museum or History Link ‘Knitting for victory’. I like Larissa & Martin John Brown’s Knitalong, Celebrating the tradition of Knitting together which has sections on the cottage industry, and wartime knitting, while Vogue knitting, the Ultimate Sock book has a great conscise history. For a more academic look at the history and impact of knitting have a look at Jane Jakeman’s review of two new major academic histories and an appraisal of the history of knitting ‘The Tangled history of knitting’. This entry was posted on 18 February 2010 at 07:23 and is filed under History. You can follow any responses to this entry through the RSS 2.0 feed. You can leave a response, or trackback from your own site. Oh my. “oozy knitted things”? I think you meant “cozy”!